The History & Mystery of Decatur's "Most Haunted"
Looking back now, I can't really remember my first visit to the Lincoln Theater. I must have been young though because during my childhood years, the theater was always open. There was no place else in Decatur quite like the Lincoln. Of the two downtown theaters, the Lincoln and the Avon, you could always perhaps count on a better show at the Avon, but the atmosphere of the sprawling, old Lincoln was a place of wonder for a child of my interests. The huge auditorium always seemed to be cast with shadows, whether the house lights were on or not. You could wander the mezzanine, perhaps slip into the balcony or even vanish behind the curtains where only darkness, hanging ropes and discarded scene props seemed to wait. Journeying down into the basement to find the bathrooms was a journey all its own and one that was guaranteed to send chills down the spine. And why was this? Because the Lincoln Theater, the stories always said, was filled with ghosts! Growing up, my family visited the theater often. This was in the days when the grand old theaters were still showplaces, albeit fading ones. The cracker box cinemas at the shopping malls were still in the future and the best way to see a film was still on the big screen. On Saturdays, we frequently attended the show at the Lincoln, first buying our popcorn at Dell's on Merchant Street, and then taking our seats for the show. By 1980 though, this afternoon ritual came to an end when the Lincoln closed its doors and went dark. Sadly, except for a few music events, plays and even an occasional film, it has remained that way ever since. I can say with all honesty that I have had more encounters that I believe to be supernatural in nature at the Lincoln Theater than at anywhere else in Decatur combined! Many of these encounters have been chance happenings when ghosts were the furthest things from my mind. Ghostly footsteps, inexplicable sounds and even icy cold chills that appear and disappear without explanation have been incidents of my Lincoln Theater experience. I have been both alone and with others when strange things have occurred and in some cases, photographs and videotape have managed to capture the elusive presences that have been previously part of my subjective encounters. There are ghosts at the Lincoln Theater, have no doubt about that. In the section ahead, I plan to chronicle their presence here for the reader and introduce you to the myriad of hauntings that linger in this space. The spirits of the building were created by the history that has passed through its doors and has managed to take root within its walls. The Lincoln is a glorious place and the ghosts who dwell here are glorious in their own right, from a stagehand who died here to the restless phantoms of those whose lives ended on this spot before the theater ever existed. With that said, let me be the one to welcome you to the Lincoln Theater and to assure you that you have nothing to fear when the doors close behind you and you enter the shadowy world of the auditorium. The ghosts of this place are but flickering images of the past, lost in a world that is of a time and space different than our own. Now is your chance to enter their world, this stately old theater, and meet those who linger here face to face! The theater was not the first building to stand on the site that it now occupies in downtown Decatur. Aside from frontier construction by the early settlers, the first real building on the site was the Priest Hotel. W.S. Crissey opened it on the northwest corner of the Old Square in 1860, although it was completed and operated for many years by Franklin Priest. In 1880, Riley Deming took over the establishment and changed its name to the New Deming. It was later purchased by Augustine Wait and in 1892; he changed the name to the Arcade Hotel. Eight years later, he would remodel, expand, and call it the Decatur & Arcade Hotel. There was a horrible fire in 1904, which destroyed the building, but it was rebuilt on the same site a short time later. It was in 1915 however, when disaster struck. On April 21, 1915, a spectacular fire broke out and destroyed the hotel, claiming two lives and damaging several of the surrounding structures. The blaze was believed to have started because of some oily rags that were left near the hotel's boiler. A night watchman discovered them smoldering and tried to put them out, but was driven back by thick smoke that began churning from the refuse. The blaze quickly spread and while all of the fire equipment in the city arrived on the scene within minutes, smoke was soon billowing from the lower windows. Water began to be pumped from the trucks but because the smoke was to thick to enter the basement, the firefighters had no idea of the exact location of the fire. It was said that a roar came up from the crowd assembled in Lincoln Square when the first flames appeared. The Decatur & Arcade Hotel burned to the ground in April 1915... leaving lingering spirits behind in the ashes. The fire came from the rear of the hotel and could be seen glowing through the front doors. The firemen began dragging hose into the building but within ten minutes, the blaze had entered the walls and was eating through the roof of the hotel. At that point, Fire Chief C.W. DeVore began directing his men to turn their attentions to the other buildings nearby, as there was no hope for the hotel. 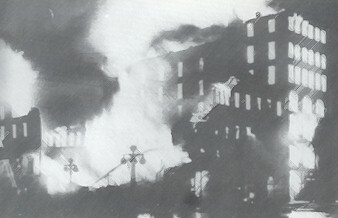 The nearby structures, including the Bachman Bros. & Martin Co. furniture store, the YMCA, the First Presbyterian Church and the Odd Fellows Building, were saved but as the north wall of the seven-story Arcade building collapsed, it struck the Bachman Bros. warehouse with a tremendous crash and a loud explosion. The furniture store was saved from heavier losses thanks to a heavy firewall that refused to give in and a new sprinkler system. The two men killed in the fire were William E. Graham, an engineer for the Decatur Bridge Co. and C.S. Guild, a traveling salesman from Lockport, New York. The bodies were found in the ruins, although several other hotel guests were never found. Whether or not they escaped from the inferno is unknown. What is known is that the disaster could have been much worse. If it had not been raining before the fire broke out, it's possible that the entire west part of downtown, including many homes, could have been destroyed. The hotel was never rebuilt and the Lincoln Theater took the older building's place. Many have pondered the question as to whether or not the spirits of the people killed in the hotel fire might walk in the dark corners of the Lincoln Theater. It now stands directly on the location of the former hotel and many have speculated that the ghosts could have passed into the new building and may have taken up residence there. Fires in Decatur had been far too common in years past. A number of public buildings had been destroyed by fire, including the Powers Opera House, which burned twice. Being built on the site of a hotel destroyed by fire must have made the designers of the Lincoln Theater especially aware of the possible dangers and they were determined to make this building "absolutely fireproof". The new theater was constructed by Clarence Wait in 1916 on land that he had inherited from his father's estate. The Decatur architectural firm of Aschauer & Waggoner was hired to draw up plans for the theater and the buildings surrounding it. These buildings included the Odd Fellows Lodge and seven smaller stores that fronted Main Street with offices on the second floor. These smaller stores were given the name of Lincoln Square, which was also the name of the theater until it was shortened in 1930. The theater was designed and built on a section of land that would be L-shaped, with an entrance in the middle of the block. To insure that the place was "fireproof", the original boilers were housed in the Odd Fellows Building and separated from the theater by a thick firewall. This wall, which was about two-feet thick, surrounded the entire building. The interior of the building was also carefully designed as the walls, floors, railings, ceilings, fixtures, and even the curtains, were all said to be impossible to burn. Architect Charles Aschauer claimed that the entire block could burn down, but this theater would be left standing and little did he know that there would be times when this boast would be tested! The public got its first look at the interior of the new theater in October 1916 when John W. Dooley held a Christian Science lecture there. The formal and official grand opening took place at the end of the month, on October 27, 1916. The Lincoln opened to "standing room only" crowds of Decatur's finest citizens, dressed in black tie and formal wear and eager to see the new, glorious theater of which they had heard so much about. The first program to be presented was George M. Cohan's stage comedy, Hit the Trail Holliday starring Frank Otto. In addition to the show, speeches were given that night by Mayor Dan Dineen and by Clarence Wait, who once again bragged about the "fireproof" status of the theater and its solid and safe fire escapes. The audience loved the show and raved about the spectacular design of the theater, from its private seating boxes, to the massive ivory-colored columns, to the 1,346 seats, all of which offered a splendid view and wonderful acoustics. Also new to Decatur was the mezzanine seating, which ran just below the balcony and offered seats that were only slightly above the level of the stage. 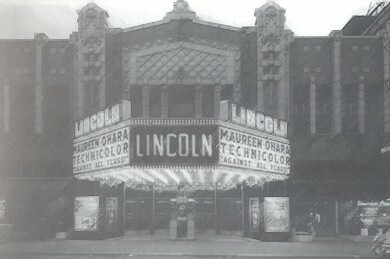 In those early years, the main emphasis at the Lincoln was on stage shows and vaudeville acts. The community also put the theater into use as well and it hosted many small, local productions and the Decatur High School commencement services each spring. 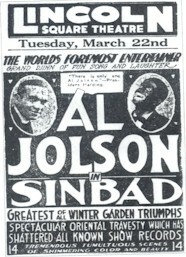 Many famous stars appeared here, including, Ethel Barrymore, Al Jolson, Ed Wynn, Jeanette MacDonald, and many others. Audiences also thrilled to such attractions as a sparring exhibition by Jack Dempsey after his famous fight with Georges Carpentier. In February 1926, the theater hired a 12-member orchestra to provide music for all stage productions and the silent films that were starting to gain popularity. Vaudeville still remained the most popular attraction the theater had to offer however and the orchestra's leader brought a young, unknown comedian named Bob Hope to the Lincoln in 1926 to show Decatur how to dance the "Charleston". Hope was just starting his career in those days and he would return often during the 1920's to appear in vaudeville shows and comedy productions. 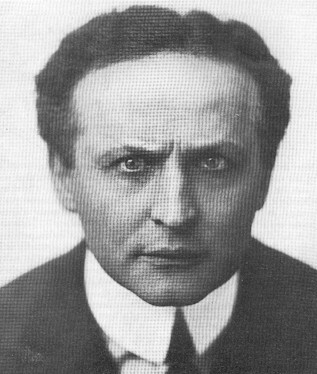 One of the most enigmatic of the performers to allegedly appear at the Lincoln was the stage magician and master illusionist, Harry Houdini. Houdini was not yet a worldwide sensation by the time that he came to the Lincoln late 1910's, but he was well on his way to becoming one. According to Lincoln Theater legend, Houdini's visit has been permanently marked on the wooden stage of the theater by a narrow trap door that has been nicknamed the "Houdini Hole". Below the hole, metal hooks are imbedded into the ceiling of the basement as silent reminders of the magician's visit. For a number of years, people believed that the hole in the stage had been cut for the magician to escape through during one of his illusions and that the hooks below had held some sort of safety net. However, this turned out to be incorrect. At the time Houdini would have played the Lincoln, he was perfecting an escape that used a very large water tank, into which he would be lowered upside-down and then have only a few moments to escape. The rectangular hole in the Lincoln stage was cut so that a hose could drop below the tank and empty into a drain in the basement. The metal hooks were actually used to hold the support ties for the drainage hose. But was the "Houdini Hole" really used by Houdini? There are those who claim the famous magician never played at the Lincoln at all. They dismiss the recollections from those who remember his visit, believing that they are mistaking some other performer for the legendary illusionist. The name for the "hole" in the stage, they state, was a mistake and likely, those who remember a famous magician coming to the Lincoln have mistaken Harry Blackstone for Houdini. There is no denying that Blackstone did perform at the Lincoln several times but those who have claimed to recall Houdini's visit remember Blackstone as well. A check of newspapers of the time offer few clues. 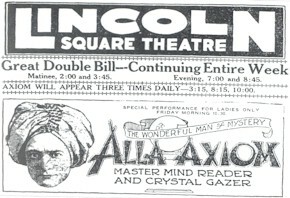 There are advertisements for visits by Blackstone and even little known illusionists like "Alla Axiom", a "master mind reader and crystal gazer" but no mention of Houdini. How do we explain this if Houdini really played the Lincoln? According to one interview that I conducted with a staff member who worked at the theater for many years, there was no advertising for Houdini because he was not famous at the time. He was part of a vaudeville troupe that played the theater and received billing in the troupe's advertising but not with the theater. He was still a couple of years away from his great fame, this man explained, which is why no mention was made in Decatur newspapers of the day. Still curious as to how so many people remembered Houdini --- even though others insisted that he never played the Lincoln -- I continued my research. I soon found other clues about Houdini and the Lincoln Theater. According to an interview with magician Harry Blackstone, Jr., the son of Blackstone, his father toured the vaudeville circuit, often following in the wake of Houdini. The two men had similar acts and while friendly, were fierce competitors. If one of them played a theater or circuit, the other soon followed. For this reason, the younger Blackstone stated, since his father played the Lincoln then this means that Houdini almost certainly did too. But did he? Well, we will likely never know for sure. Someone, be it Houdini or Blackstone, left a permanent mark on the stage of the Lincoln Theater and an indelible mark on the history of this grand old place. Moving pictures continued to increase in popularity in the city and Decatur was demanding more and more films to take the place of stage shows. Only major attractions were needed to fill in between the films, so the theater booked live emcees to host the films months in advance. This filled the need for live actors and celebrities and still managed to bring the moving picture crowd into the theater. Every movie became a major attraction with the orchestra playing overtures to accompany the action on the screen. A pianist, and later an organist, was hired to provide lighter music for the serials, newsreel footage and the comedy films. In April 1928, the first "talkies" came to Decatur and played at the Empress Theater. The Lincoln began showing them 14 months later at the close of the vaudeville season. This would herald the end of the vaudeville days at the Lincoln, and perhaps in the entire city. The sound equipment was installed in the theater for films, making silent movies obsolete, and bandleader Billy Gail and his orchestra were promptly dismissed. From that time on, two films were shown each week with one running from Sunday through Tuesday and the other from Wednesday to Saturday. The first talking films shown were Nothing but the Truth starring Richard Dix and a musical called Desert Song. That same year, the Lincoln was purchased by the Great States chain of theaters, which also purchased the Empress and the Bijou. The building itself remained the property of Clarence Wait until his death in 1936. Ownership of the theater was then passed to his brothers, Arthur and Fao Wait. Although movies had largely replaced live entertainment at the Lincoln, there were still special performances booked here on a regular basis. It was during one of these performances that the "fireproof" claims of the theater were first tested. In September 1942, Harry Blackstone returned to perform at the theater. The auditorium was filled with about 1000 school children when fire broke out in the Rambo Drug store, located next door to the Lincoln Theater. Alerted to the danger of smoke entering the theater and the building catching on fire, Blackstone remained calm and jokingly told the audience that for his next trick, he was going to make them all disappear from the theater in five minutes. He then directed them to leave, row by row, out of the alley doors and out of the fire escapes in the balcony. He promised the children that they were assisting him in a marvelous new illusion, which he would explain to them outside. After he had successfully cleared the theater and learned that the danger was past, Blackstone is said to have sobbed with relief from the stress of his heroic evacuation of the theater. Years later, in 1960, while a guest on the television program "This is Your Life", he stated this had been the "greatest trick of his career". The fire would last for four hours and would completely gut the drug store and Cook Jewelers, which shared the space. The fire was so intense that the floor of the building collapsed into the basement. It also heavily damaged an adjoining flower shop and beauty parlor, but no damage was reported to the Lincoln. Apparently, it really was "fireproof" after all! These claims would be tested again in 1960 when another fire did major damage to buildings south of the theater. The section of the building that was located above the theater lobby would be virtually destroyed, which also explains why this section can be seen in older photographs but is not present today. The Lincoln itself, which was showing the film The Bramble Bush at the time, was only slightly damaged. The "fireproof" claims have not been tested since and the building has remained architecturally sound after more than 80 years. The theater operated steadily for many years and was sold again in 1974 to Plitt Theaters Inc., which bought out the entire Great States chain. The Lincoln Theater only remained in the chain until December of that year, when management was passed to the Kerasotes chain that was based out of Springfield, Illinois. At this time, they already owned four of Decatur's other theaters. They leased the building on a month-to-month basis and in December 1980, were informed by William Wait that their lease would not be extended past the end of the year. Unfortunately, the Kerasotes chain had a reputation for stripping everything usable from a theater before they left it and they followed this same plan at the Lincoln. They removed much of the valuable equipment, from projectors to the interior mechanisms of the speakers. The projectors in the Lincoln in recent years have been borrowed from private individuals and salvaged from the Rogers Theater, while the speakers remained empty shells mounted on the walls in the balcony. After that, the Lincoln closed down for many years, only opening occasionally for live music and barely attended events. By 1990, the building had deteriorated badly and was suffering from neglect. It had been abandoned by everyone except for the bats and pigeons that had taken up residence in the auditorium. Thankfully, the Lincoln came to the attention of a restoration group and some life has been brought back to the old place. Thousands of dollars and countless hours of work have been put into the theater, but it still has a long way to go. The restoration effort has been a long and painfully slow project with possibly many years remaining before it will be completed. This has not stopped many local and national groups from performing here however and many times, during these performances, regular people have encountered things in the theater that can only be described as something well beyond the ordinary! Stories have circulated about hauntings at the Lincoln Theater since at least the 1930's. Reports by witnesses from those early days of film in the theater have suggested that as least one ghost haunts the building. However, in more recent times, the numerous encounters here have led many to believe that a multitude of spirits may linger in the Lincoln. The most famous ghost of the Lincoln is rooted in a legend from the vaudeville days. His name was "Red" and he was a stagehand at the Lincoln during the days of live performances. He was deeply attached to the theater and loved the place, working long shifts and coming to the theater on his day off just so that he could be among the actors and entertainers. It was said that Red always dreamed of becoming a performer himself, as he was a commanding presence with his bright, auburn hair, but he was simply too quiet and shy to ever take the stage. He contented himself to working behind the scenes and perhaps even standing on the stage at night, looking out on the empty theater. 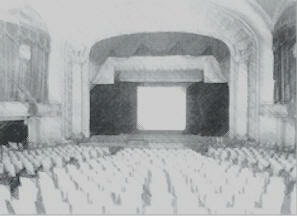 Perhaps he imagined an audience in those darkened seats, assembled to watch him perform in the latest show. One night, during a performance, Red was working on the catwalks. This area is about 75 feet above the stage itself and was used in those days to lower props and scenery flats. Red was used to working up in those dizzying heights and it never really bothered him. Then, on that fateful night, the unthinkable happened. At least that's what the stories say but unfortunately, the truth behind the tale isn't nearly as exciting. There really was a stagehand nicknamed "Red" who worked at the Lincoln Theater during the vaudeville days. Red also had only one arm but he did not lose it (along with his life) in a horrific accident. He was a veteran of World War I and he had lost his arm during the fighting in Europe. When he returned to Decatur, he took a job as a stagehand at the Lincoln and soon became a "novelty" because he managed to do all of his work with one arm. In fact, he was faster than many of the other stagehands (most who were much younger than he was) at pulling the ropes and lowering the lights and they were using both of their arms. Red was a likable man and completely devoted to the theater. This was perhaps the reason he was so memorable to later generations of staff members as the "stagehand who never left the theater". As mentioned, Red did not die in a terrible accident but he did die at the Lincoln Theater. According to my sources, he sat down to take a nap after his lunch one afternoon in 1927 and simply never woke up. He passed away in his sleep --- leaving an indelible impression behind. Soon, after people began to speak of a ghost at the Lincoln Theater, they immediately assumed that it was Red. Over the years, dozens of witnesses have reported strange sounds and footsteps in the otherwise empty theater and these are sounds that cannot be explained away as simply the theater's acoustics. They have also reported whispers, strange voices and even a shadowy apparition in the theater's balcony. However, this strange figure is not described as looking like Red, but rather as a woman in a long, old-fashioned dress! This is only one of the many reports that cause some to believe there are a number of ghosts in the building. Several other witnesses have reported their own brushes with hazy forms and figures seen out of the corner of the eye ---- and none of these descriptions match! Could there be a legion of phantoms left behind in the theater? In addition to visual sightings, there have been a number of other encounters as well, including the aforementioned footsteps and sounds. Many have experienced inexplicable cold chills in certain spots in the building and others claim to have been touched by unseen hands. Several others have mentioned seeing theater seats in the auditorium actually raise and lower by themselves, as if an unseen audience was watching the proceedings on the stage. I had my own strange encounter a few years ago when I was working in the quiet theater one afternoon, making preparations for an upcoming Halloween show. I happened to be off to the side of the stage, behind some curtains, when I clearly heard someone walk up the steps and out onto the wooden stage. When I came out from behind the curtain, I was startled to find that there was no one there but me! I quickly searched the area, and even the rest of the theater, but the place was completely empty. 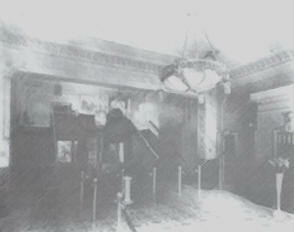 Other unexplained incidents have occurred around what may be the most haunted spot in the theater. It is a metal, spiral staircase that is located in the back corner of the stage. Many witnesses claim to have had unearthly encounters on and around the staircase. For example, in 1994, an entertainer who was performing in a traveling production reported that he saw a man lurking on this staircase. He was in the back corner changing his costume when he heard a voice whispering to him. When he looked up, he saw a shadowy figure on the steps. He was unable to describe the figure, but he was convinced that it was a man. He complained about the presence to a nearby theater staff member, but when they checked the staircase, they found it empty. The man was gone but there was nowhere that he could have vanished to! Strangely, the actor had no idea about the legends of the Lincoln, nor that the staircase was rumored to be haunted. In addition, I can personally vouch for at least one encounter on this intimidating staircase, because it happened to me. I still have no other explanation for what occurred, other than to say that I was followed up the stairs by one of the theater's resident ghosts! I was in the theater one evening in October 1995 with a reporter and a cameraman from a local television station. They had contacted me about haunted places in Central Illinois for a news special and one of the places that I took them to was the Lincoln Theater. After an interview about the hauntings, I decided to join the cameraman, Robert Buchwald, for a trip up the spiral staircase. He took his camera along, hoping to film the theater's stage from this vantage point. It was a good thing that he brought it, because we would have had no other source of light to make the trip up there with. We rounded the staircase and then reached the top. We looked around the small and confined space for a few moments, exploring a small room that leads to the theater air ducts. Other than this dusty chamber, there is not much else to see up there. We stood talking for a few moments, and then what happened next was enough to convince even a skeptic like Robert Buchwald that there may be more to the Lincoln Theater than first meets the eye! It seemed innocent enough at first. We had climbed the spiral staircase and left the reporter down on the stage by herself. We weren't surprised to soon hear the sound of her footsteps as she followed us up the stairs. Her hard-soled shoes made a distinctive sound as they echoed on the metal steps. Realizing that we had the only portable light, and the staircase was quite dark, Robert leaned over the railing with the camera so that the reporter would have some light to see by. Just as he did this, from out on the stage, we heard the sound of a voice calling out to us. We looked and saw the reporter standing in the middle of the stage ---- dozens of feet from the base of the steps and much too far away to have been climbing the staircase just moments before! We suddenly realized that the footsteps on the staircase had not belonged to the reporter. So, who was climbing the staircase? We didn't know but when the sounds finally stopped, we didn't stay up there long enough to find out! Does the ghost of "One-Armed Red" really roam the dark corners and back hallways of the Lincoln Theater? Or is he just a legend created to explain the generations of strange phenomena that has been reported there? Could there be a large number of spirits still inside of the building, drawn to the energy of almost a century of sadness, heartbreak and tragedy? Most importantly, is the Lincoln Theater really haunted at all? If you are skeptical about the many tales of the theater, I challenge you to wait before answering these questions. Wait to ponder them until some night when you have the opportunity to come to the theater and sit in the dark auditorium --- by yourself. 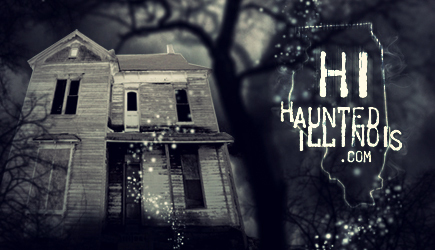 Is this place really haunted? Or is that just the sound of an old building settling in the shadows behind you? Is it your imagination ---- or is it something else?